A band of 22-carat gold, set with a green bloodstone which measures 5/16 in. x 7/16 in. and bearing an intaglio of the Browning crest and motto, was worn by Robert Browning for about 40 years. It is visible in a number of his portraits and photographs and the impression of the rampant lion crest is evident on a number of envelopes in the Armstrong Browning Library manuscript collection. 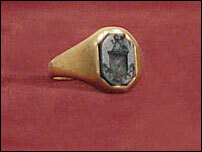 The chalcedony gemstone, in a gold setting, bears a clasped-hands design and the word L'AMITE appearing backwards so the ring can be used for making impressions on wax. The ring was not designed for finger wear but has attachments for wearing on a chain. It originally belonged to an uncle of Elizabeth Barrett Browning's, then to her, and then to Pen, who gave it to Fannie Coddington as an "engagement ring." The 2 1/2 in. long gold brooch, with intricate floral design and three amber topazes, was given by Robert to Elizabeth on their first wedding anniversary, and later given by him to Fannie Browning. It was presented by Fannie to Mrs. Herbert Stead. The black onyx cross, decorated with diamond chips, silver, and a central pearl, is attached to a 17-inch chain composed of black onyx rods and cylinders. 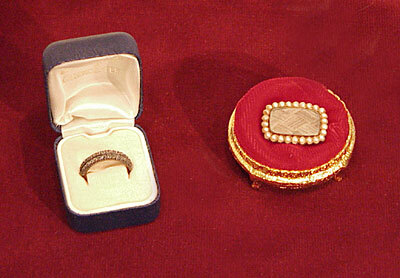 It was given by Robert to Elizabeth on their honeymoon in 1846. It was later given by Browning to his daughter-in-law, Fannie. Gold with 2 rows of diamonds, this ring belonged to Browning's mother, Sarah. Enclosed in a gold memorial brooch is a lock of hair of the poet's grandfather (also named Robert Browning). It is surrounded with 26 seed pearls and inscribed: "Obt. Decr. 11th 1833-At.84." This pair of gold links belonged to Elizabeth Barrett Browning's cousin George Goodin Barrett (1792 - 1854). The set passed into the possession of George Goodin Moulton-Barrett (1864 - 1943), Elizabeth Barrett Browning's nephew, from whose estate they were acquired. The gold mounted topaz brooch, fashioned from Elizabeth Barrett Browning's father's seal with his initials (EBMB) in reverse and the Barrett griffin, once belonged to EBB. It was later presented by Pen Browning to Mrs. George Murray Smith.